Tokyo -> Frankfurt -> Helsinki. Unfortunately, all good things must come to an end. Yeah, it was time to leave Japan and return to Finland. I was running out of cash anyway, so in this sense it was a good time to mount the saddle and head back home. Early in the morning I packed my stuff into a logical order, threw the not so relevant tourist papers and plastic bags into the trash bin, watched the morning programs one last time and left the room. Downstairs I used the public computer and informed the folks back home of my return. I paid the bill for the four nights I stayed at ryokan Shigetsu and as a souvenir the desk clerk gave me a nice mug! That was a nice surprise that cheered me up. The Nakamisedoori market street was once again preparing itself for another busy day as I walked pass it. I took the Ginza line subway from Asakusa to Ueno and from there the Skyliner on the private Keisei line to Narita airport. This was a cheaper train than the one I used when I came to Tokyo from the airport (the NEX train). At the airport things moved on just as smoothly, although a guard guided me to the wrong check-in desk first without even asking. The biggest fear was at the passport checkpoint, since it had the receipt of the electronic dictionary attached to it, but the official barely looked at it when he ripped the papers from my passport and waved move on. Hmh, so it wasn't anything I should have stressed about. 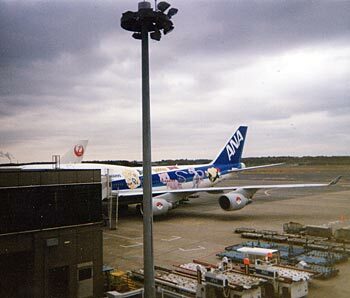 Nothing surprising from there on: taking the shuttle train to the departure satellite wing, visiting tax free shops and boarding the ANA plane, which apparently was the same that brought me to Japan. Again I was treated with a seat with no passengers on either side. One of the cabin assistants from the previous flight was on board too and she seemed to recognize me and waved at me with a smile, but unfortunately didn't wave back before I recognized her too late. Nice gesture anyway. The plane was ready for take off and I was a bit annoyed some gaijin tourist tried to film the take off with his fancy digital camcorder despite the announcement of turning off electronic devices and the cabin assistant reminding the guy about it before he gave up (and instead started to film with his fancy digital camera). Sure, it probably won't affect the flight, but rules are rules, buddy! Otherwise the flight was quite much the same as the previous one: lunch, tea, sleep, snacks, two movies, dinner, tea, preparation for landing. I managed to get a bit more sleep than on the previous flight, but still not as much as I wanted. During the flight I also wrote down the essential things that happened during the trip (of which a majority of this site's text is based on!). Once the plane landed at Frankfurt (and before that flying over Finland again), not only did I leave the plane, but also the last touch to Japanese hospitality and it was plain Europe from now on. Feeling rather empty but extremely satisfied, I walked to the waiting lobby for the next plane that would take me to Helsinki. So I was back in Finland safe and sound. The arrival lobby was dead quiet and I wondered where my parents were since they promised to pick me up, but after calling them it turned out they looked at the wrong airliner and thus thought I would come two hours later. Great. I took a taxi instead of taking a bus, which was a mistake, as I ended up paying 30 euros for it. Argh. The ground was covered with snow, the air was crisp clean and the surrounding forests peacefully silent. When I rang the door bell of the commune house where I live with my friends, the last step of my journey was taken. What a fantastic journey it was too. And I was already planning to visit the country again soon. back to top | proceed to conclusion! Heading for Narita airport (I wonder what I was trying to capture in this photo...). 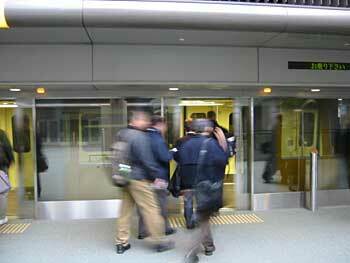 Entering the shuttle train at Narita airport. Same pokemon airplane as in the previous flight. 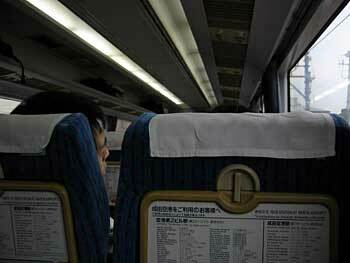 Keisei skyliner - An alternative train route between Tokyo and Narita airport, cheaper than the Narita Express.